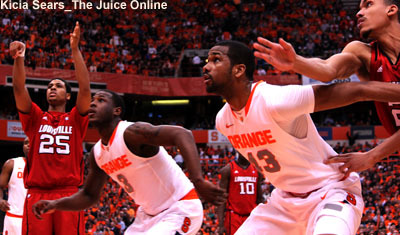 It’s been a down year for Syracuse Orange basketball, and it’s about to get even more depressing. Tyler Lydon, a potential late first round pick after his freshman year, saw his stock drop this year, and is now in danger of dropping into the mid-second round. Lydon, who was often maligned and criticized for failing to take the reigns of the underachieving, NIT bound Orange last season, is one of the harder prospects to get a grasp on. Some scouts love him and see him as a late first rounder. Others see him dropping into the 40s. And it’s not hard to see why. His numbers from his first to second seasons were mostly the same. His scoring and rebounding saw small upticks, while his shooting percentages, blocks, steals and turnovers were all slightly worse. He will hear his name on draft night, nobody knows when though, just as no one really knew what they’d get on nightly basis from him last year. 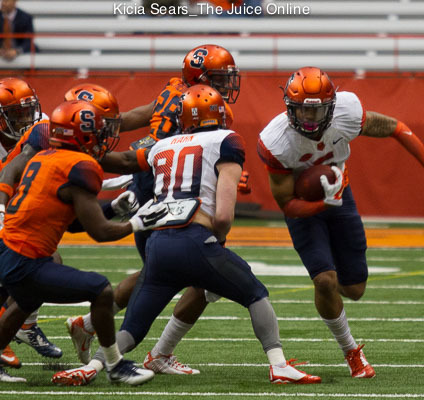 Assuming he drops, it will cap what was a forgettable year for the Orange. 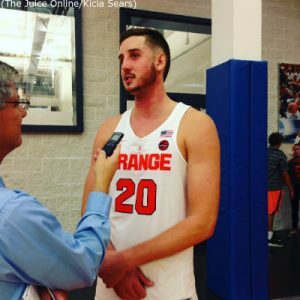 It would make sense for the Orange to fail to produce a first round pick for the first time since 2011, following a season in which they lost 15 games (the most in 49 years) failed to make the NCAA tournament, got upset in the NIT, and lost future head coach, Mike Hopkins, to Washington. The Orange have had at least one first rounder in 11 of the last 15 NBA drafts. The first of those 11 was Carmelo Anthony, who led the Orange to National Championship after the 2002 team failed to produce any NBA draft picks. No, the next Carmelo Anthony isn’t on the 2017-18 roster, but at least there’s evidence that Jim Boeheim’s teams rebound from talent deficient rosters. There’s also plenty of evidence to the contrary with 3 of the other 4 teams either losing in the first round of the NCAA Tournament or not even making it. But the 4th team, the 2011-12 squad, lost in the elite eight. So again, let’s hold out hope this is the start of a successful 2017-18 season. As for Tyler, he’ll likely find his niche in the NBA, whether he be drafted in the first or second round. He is the perfect stretch-four for today’s game, and has enough athleticism to compete on the defensive end of the floor. The question mark for me, is whether he has the drive and will to compete on a nightly basis and leave it out there. If he finds that mental toughness I think he’ll have a sustained career. If not, well, he’ll probably last as long in the NBA as he did on the hill.